I originally planned to take my children along to Redditch Fire Station when they had an open day earlier this year. It is near to where we live so it would have been possible to drop in briefly show the kids around a fire engine and then still do something else the rest of the day. Unfortunately the Redditch Fire Station Open Day was cancelled due to bad weather. The following weekend I asked my daughter what she'd like to do and she replied "Go and see the real fire engine", so clearly she had been looking forward to it. I went back onto the Hereford and Worcester Fire and Rescue Service website and found that there was an Emergency Services Day at Evesham Fire Station later that day, so we went there instead. See more photos from the Emergency Service Day at Evehsam fire station. 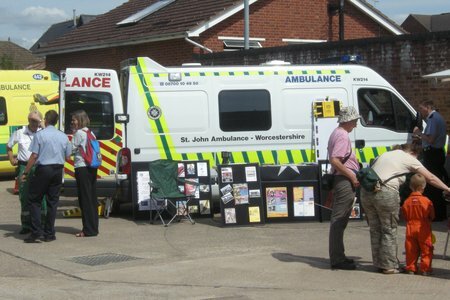 The event was quite a good size with: several fire engines, fire service major incident lorries, West Midlands Ambulance Service, St John Ambulance, West Mercia Police, River rescue boat and the Air ambulance demonstration helicopter. When we arrived they we had just missed a multi-services demonstration of releasing a casualty from a car after an RTC (road traffic collision). They announced the time of a later demonstration and when I explained what it was my daughter said that she would like to see it. We looked around the rest of the exhibits, went and did a bit of shopping in town and then returned in time for the later demonstration. It was well worth watching the demonstration. It lasted about 20 minutes and had a running commentary by the fire station officer. My 4 year old daughter enjoyed it, but my 1 year old son was getter restless by the end of it. Afterwards we went up and looked at the car that they had cut the roof off. There were lots of free goodies, including pencils, bugs, leaflets, comics and even a sports drinks bottle. We bought some toy fire helmets (£1 each for charity) and some donations for air ambulance badges and river boat flags, other than that and the car parking it didn't cost anything. A trip to the fire station is both educational and fun for children. Keep an eye out for one at your local fire station.